Front-end: Design Thinking embodies the complete new product development process, but Blueprinting ends with a business case… before the solution-development stage begins. B2B: Design Thinking applies to all types of innovation, but Blueprinting is optimized to understand the needs of B2B customers. If you are using Blueprinting, should you study Design Thinking? Yes! You’ll find this to be an entirely “sympatico” and refreshing way of thinking that can only help. Should you stop using Blueprinting? No, it contains unique and powerful tools for uncovering B2B market needs which are lacking in most Design Thinking. While design-as-a-thought-process was first discussed in the late 1960’s, Peter Rowe’s 1987 book, Design Thinking, popularized the term. It described approaches used by urban planners and architects. David Kelley, who founded IDEO in 1991, first applied Design Thinking to business opportunities. Both artists and scientists operate on the physical world as it exists in the present… while mathematicians operate on abstract relationships that are independent of historical time. Designers, on the other hand, are forever bound to treat as real that which exists only in the imagined future and have to specify ways in which the foreseen thing can be made to exist. Next, let’s examine the common ground shared by Design Thinking and New Product Blueprinting… before exploring their differences. Begin with the end: New Product Blueprinting and Design Thinking both “begin with the end in mind” (Stephen Covey). Design thinkers sometimes use the term “wicked problem” to describe situations where both the problem and solution are initially unknown. In Blueprinting, users first seek to fully understand customers’ desired future state by exploring dozens of customer outcomes. Ambiguity is good: Design thinking can sometimes feel “fuzzy” to those comfortable with more analytical methods common in science and engineering. But it is precisely this willingness to examine many possibilities—and to iterate—that gives the methodology its power. In Blueprinting, users are encouraged to suspend work on “the answer” (their solutions) until they understand “the question” (customer needs). Customer immersion: Design thinking encourages designers to fully understand the customer’s world, using interviews, observation, etc. In Blueprinting, the mantra, “You don’t know what you don’t know” reinforces the need to let the customer lead the supplier to whatever they think is important. Blueprinting’s AMUSE customer tour methodology is the B2B analogue to Design Thinking’s ethnographic research. 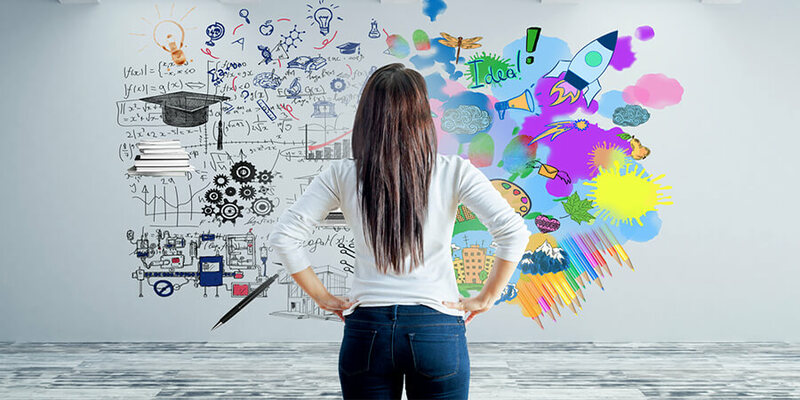 Diverge and Converge: Both Design Thinking and Blueprinting rely heavily on divergent thinking (creating choices) and convergent thinking (making choices). In fact, Blueprinting does this twice: first around customer outcomes, and then around supplier solutions (see diagram). Compared to most Design Thinking, Blueprinting is more rigorous in the former (using Discovery and Preference interviews). 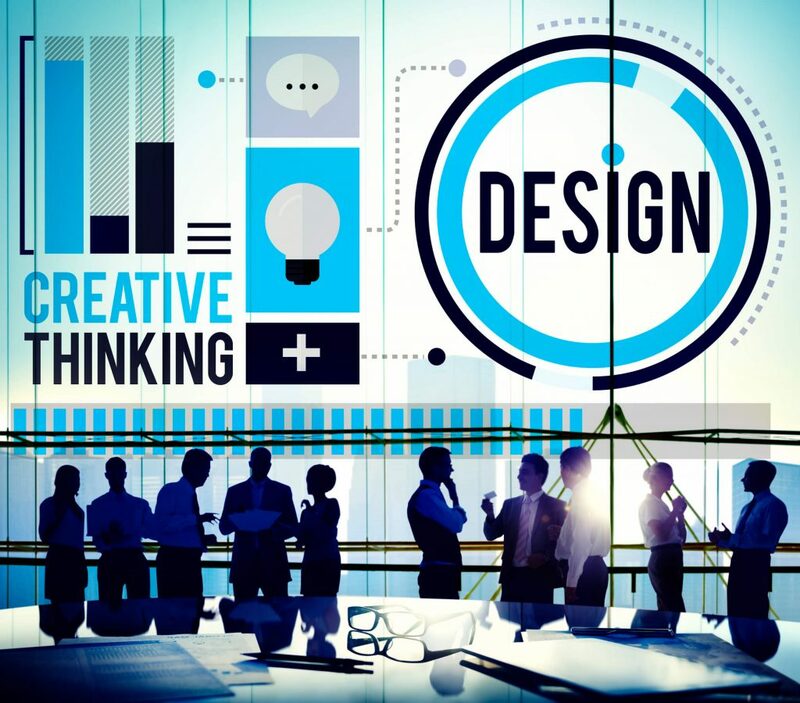 When New Product Blueprinting users have experimented with Design Thinking, they have enjoyed its refreshing customer-empathetic mindset… and the fact that the two methodologies can complement each other. It is seen as a “good thing” that they do not completely overlap. New Product Blueprinting ends with a business case which, if approved, allows the team to proceed into the solutions-focused development stage. Design thinking continues on, providing methods for developing potential solutions. Some solutions-based brainstorming is included in New Product Blueprinting (Step 6: Technical Brainstorming), but the goal here is merely to identify technical avenues—not solutions—that would be pursued post-Blueprinting if the business case is approved. Design Thinking also includes approaches for testing the new product design. These include rapid prototyping and user-experience modeling. In some cases, trade-off analysis can also be useful to test multiple design options. Finally, Design Thinking includes many methodologies for understanding the customer’s world. In most cases, these were designed for consumer applications, and Blueprinting users report some are difficult to use “as is” for B2B customers. Still—depending on the nature of your B2B market—you may find helpful tools or “inspiration” for new approaches you can use to supplement Blueprinting methods. This means that the outcome you uncovered in Discovery interviews (Step 2) will be rated for customer eagerness in Preference interviews (Step 3), compared to competitive offerings in side-by-side testing (Step 4), and so on. Could users develop this linkage on their own? Sure. Should you count on this happening for employees with busy “day jobs” across your entire organization? Probably not. While some seek to train organizations in Design Thinking, it has historically been the province of designers and other full-time experts. When Design Thinking training does occur, users typically find they are exposed to a wide range of methods… but may struggle to know when and precisely how to apply them. In the case of New Product Blueprinting, the focus is on mastering tools and skills, using over a dozen detailed job aids, 31 e-learning modules, Blueprinter software, and extensive role-playing. Engaging: Many B2B markets have few buyers, so Blueprinting interviewing is designed to impress customers (no selling, great follow-up, etc.) so large customers will later buy your product. Customer-led: Instead of using a questionnaire or interview guide, Blueprinting interviewers employ triggers and other methods to help customers diverge to whatever they think is important. 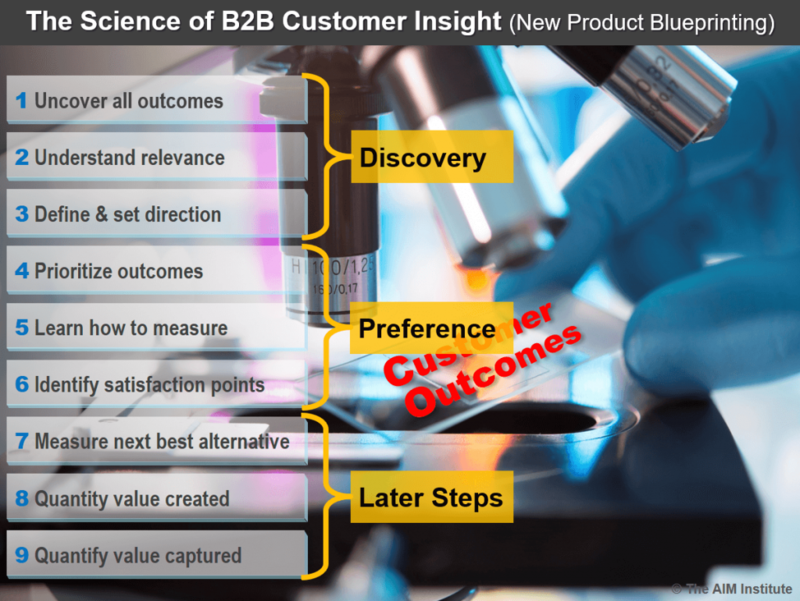 Quantitative: Because most B2B customers are quite objective, Blueprinting interviews lead to a Market Satisfaction Gap profile… so the supplier knows exactly which outcomes to pursue. Hopefully this guide will allow you to explore Design Thinking to see how you might learn and benefit from it. 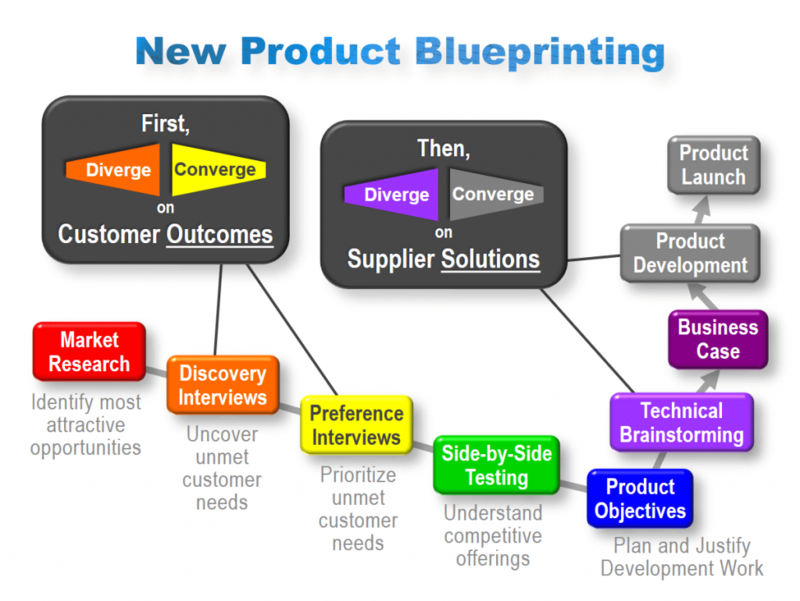 If you’re not already familiar with New Product Blueprinting, check out the Blueprinting Overview. If you’d like a free consultation, let us know. We’re happy to discuss your specific situation with you.